Firstly, on the theme of inspiration, who on the blogosphere has posted about making their own dress? Not as many as you’d expect. But a surprising number of those people are, like me, those with less experience than they ‘should’ have. I’m using this as a way to learn a lot of skills to a deadline and come out a better sewist as well as the proud sporter of a fantastic frock, and I hugely doubt I’m alone in that motivation. So, here are some bloggers you might want to check out, for a range of reasons, and who have made a whole range of different dresses. Root Branch Bole spoke informatively and eloquently about making her dress with lots of notes on patterns, techniques, and the challenges she faced along the way. I am also so in love with the dress she made that my heart aches, and it’ll be a challenge not to straight up just order the same pattern and crack into that gorgeous botanical lace. I’m not going to, but this is pretty much exactly my style. This post has no detail about techniques etc, but it is a heartfelt and beautiful post which seriously inspires me about the whole idea, and the dress she made is also gorgeous. You should, if you’re getting married, check out A Practical Wedding anyway, because it’s a wonderful website, and I bought the fantastic book of the same name which has given me the confidence to plan the wedding we truly want, and not worry anything we don’t. I really don’t think I could handle the stress: Mia from Misha and Mia had four months to plan her wedding, decided to make her dress having sewn nothing bigger than a tote bag before, didn’t start on the dress itself until 2 and a half weeks before the wedding, and then fractured a bone in her arm! And still came out with a gorgeous dress (not really my style, but I do appreciate that this is a beautiful dress) and having clearly learnt a lot in the process. Hugely useful post packed with info from Restless Grace on how she made her dress and the things she learned along the way. And in the vein of incredibly informative, Scared Stitchless blogged every step of the way throughout her wedding-dress-making journey, with loads of useful posts and in-depth info on more or less every stage. She is also honest about the things that didn’t go to plan and the ways that maybe her dress could have been better, while saying she couldn’t have been prouder or happier to wear a dress that she had made on her wedding day. That’s a good thought to end on, I think. When I walk down the aisle to meet my darling partner in just over a year from now, I will, I hope, be wearing a dress I’ve made myself. And if by some quirk of fate I somehow don’t look like the perfect cross between Keira Knightley and Kate Middleton on that day, and the dress in my head isn’t quite the same as the dress on my body, I will be hugely proud to have made it. Furthermore, if when it comes to it I can’t do it, and I end up spending £200 in John Lewis two weeks before the big day, so be it. I will have tried, and I will have learnt a lot. The thing I will absolutely care most about, and be happiest about, on that moment next year, is that I’m walking down the aisle to meet the man I’m going to spend the rest of my life with. And frankly, I would do that wearing a sack. Wearing a pretty dress – even wearing a pretty dress that I’ve worked really hard to bring together – will just be a great bonus. As I said in my last post, I haven’t done all that much sewing, to be absolutely honest. I’ve been almost inhaling sewing blogging for the past few years, obsessively collecting links to patterns I want, and slowly acquiring a significant collection of fabric and patterns – but I have only made four skirts and a dress, so far. So how am I going to get from being a total beginner at sewing, to making The Dress That I Have Apparently Been Dreaming Of Since I Was Six (warning: snide comments on media, sarcafeminism, and arch humour will probably abound, and I don’t promise that any of it will be very funny)? I have come up with a plan. Not a very well-thought-through plan, but a plan. I am going to start by doing Me Made May. For those of you that aren’t sewists (my preferred term out of the many weird modern ways of saying ‘people who sew’), this is a sewing/blogging challenge in which, for the entire month of May, you attempt to wear clothes you have made and photograph them. Most people aim for, say, one home-made item in an outfit, every single day, others go for complete outfits being home made, and some go for a set number of days per week – you can set your own challenge based on how often you can be bothered to photograph yourself, and how big your handmade wardrobe is. It doesn’t just have to be sewn either – plenty of knitwear out there, and I’ve even seen bloggers sport their own handmade shoes! (one day…). The official pledge sign-up hasn’t been released yet, but I am hoping to pledge to wear one hand made thing every single day for the entirety of May. I’ll put it up on my Instagram, which is private (if you know me IRL feel free to request to follow me! ), but I will then also try and get the photos up here but probably in round-up format. I have got a few sewing projects in the works to complete between now and then: some more basic miniskirts (I’m writing this from work, so I can’t find/remember the pattern, but it’s a Simplicity New Look pattern), a Coco dress (Breton striped, demonstrating major originality there) and, never one to shirk from a challenge, an Archer shirt (for those of you who really don’t sew (and have read this far!) shirts are really pretty complicated, with a surprisingly large number of pattern pieces, and some quite challenging elements, so… why not! P.S. I’ve set myself a fabric challenge on this one too, with a mystery sheer fabric that’s going to be a bugger to work with). I’m also moving (alone!) to London for the next few months (partner is joining me in August) so I’ll want some good projects to get my teeth into while I settle in anyway. I’m hoping that by trying to sew quite a few things to a deadline I’ll really hone my ‘basic’ sewing skills, tackle some new challenges, and be ready to face the next phase… Practice Dresses! In June I have two major social engagements: the wedding of a good friend and former housemate, and the Doctor’s Mess ball with my partner and all his work colleagues. So I’m going to make two dresses for those two occasions. For the wedding I’m going to make a knee length Elisalex dress which will have a satin layer and a lace layer, to practice working with lace (I’m hoping to have a lace layer and a satin layer for my wedding dress too). For the ball I’m going to make a full length number which will be my chance to practice hacking together the pattern pieces for my wedding dress, but to keep it from being too formal (or, in fact, being my wedding dress) I’m going to leave off the lace, and go for some colour blocking – current thinking is a black or white bodice with either a cobalt skirt or a bright red skirt (almost a burnt orange, I’m envisioning). Statement necklace and simple flat sandals and I’m hoping to look both relaxed and chic (a full length dress can be a bit overboard at these kinds of functions so paring back all the other details should keep the tone about right). That then gives me almost a year from June until next May to work on the dress proper, and decide whether the real thing, being a bit more formal, will need anything more in the way of understructure – and, indeed, if I like what I’ve made! Sorry that this blog has featured so far almost no images. I promise I’ll start adding some photos soon! This is nuts, because I’ve made about three things before in my life. I’m telling myself that having read every single sewing blog on the internet for about the last two years in obsessive detail, I’m one up on most beginner sewists because I’m at least vaguely aware of some of the things that will probably go wrong, but the truth is this is still a daft plan. The other thing I have on my side is time. My reasons are quite straightforward. I cannot get the dress I want on the budget I want. Or rather, and this is quite daft, to an extent I can – there are some lovely dresses by Ghost, or that I saw in Debenham’s, for definitely an OK price. But… I don’t want a dress straight out of the high street. I want my dress to be special, unique, made for me. The price I have to pay for that might be massive frustration, sewing-based injuries, a massive change in my glasses prescription, wonky hems, shonky guts (of the dress, I mean) and my sanity. I’m telling myself, though, that I’ll plan it out carefully, do it all in good time, and if the worst comes to the worst, know when I’m beat – with enough time still to go to John Lewis and find something I love nonetheless. I’ve been extensively shambling round the internet and found a number of people, with a range of prior sewing experience, who did it themselves. There aren’t many people who have done it themselves and posted about it, and that’s pretty frustrating, so I’m hoping to add my voice to the many by honestly documenting the process. This will not least be a challenge to me as a blogger because it is a long time since I last blogged regularly. Invisible zips, on two skirts, one much better than the other. I did some really good pattern alteration work on the Laurel dress by Colette patterns – firstly grading between sizes for the difference between my hips and waist, and secondly altering the bust dart so that the apex hits higher and the dart is the right size for my very small (AA!) breasts. I’ve never been able to wear shift dresses before so I am really pleased with this. My French seams are pretty good. And I’ve done some bias bound seams too. Currently, quite good at beginner insides of things. That’s… really not very many skills. …let alone combined both the above into one garment. So. Patience, maybe some online and real-world courses, books to be bought, wailing to my mother, forcing friends and relatives to help me sew… wish me luck. The pay-off is that I hopefully get the dress I want (within reason – I am going to have to think carefully about what I want based on what I think I can accomplish!) and the satisfaction of knowing that I walked down the aisle in something I made myself. I could still go the two-dress route and have a bought dress for the church bit and make a much more straightforward white party frock for afterwards. ideas for patterns and things I think I might need to buy. All of this subject to change once I’ve tried on some dresses for real and really got my head round what will work for me. 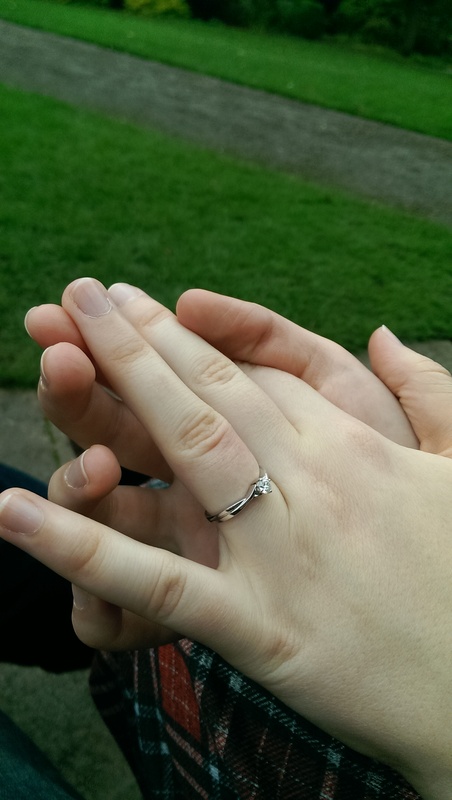 So… S and I are going to be married! How mad is that? It seems like the right next step for us but also something very different and new instead. Like all new things, they seem too grown-up when you first start them and then I’m sure you start to grow into them. Anyway, we are getting married. Not until 2016, but nonetheless. There are two things you probably want to know. I’m employed to copy edit your books. Not necessarily yours personally, but copy editing is what I do. Some books instead get sent to be copy edited abroad, and some (I believe) even get put through a computer programme that does the job. Those methods have their advantages and disadvantages, but for now, assume your book is going to be sent to someone like me. Now then, let’s make this clear. I like reading the actual text, helping clarify your writing, marking things up for the typesetter and correcting your grammar (yes, you do make mistakes, everyone does, and if I wrote a book I’d make mistakes too. There are also customs that fall into that grey area – is it a ‘rule’ or is it just ‘what we do’ to never split an infinitive, put ‘However’ or ‘And’ or ‘But’ at the beginning of a sentence, or finish on a preposition?). And my guess is that your spelling hovers, like many, somewhere in the Atlantic ocean. And whatever my preferences it’s my job to correct it to whichever one I’ve been told to go with. All that is the fun bit. Or rather what makes it fun is reading your book, and honing all the rough edges, and turning something weirdly formatted with errors and issues into something that sits neatly on the page, reads well, and conveys what you meant, while still being very clearly your style and your book. However. Referencing. This is not the fun bit. So I’m going to give you some guidelines. This isn’t a ‘how-to’ on Harvard Referencing (or your style of choice). This is a ‘how-to’ that should mean that, no matter in which style we end up presenting your references, you actually give us all the information we need first time and don’t then land up with hundreds of queries from us, giving yourself hours or days more work further down the line. I know you want to get your manuscript off your hands, but if you get this wrong it’ll land up back in your hands for much longer than you anticipated. Please don’t use the ‘referencing software’ that routinely comes with Word and other processing packages these days. We have to literally copy and paste everything out, which will take us hours and probably result in some confusing due to residual invisible formatting. Given that the referencing is the first thing I check, this is also likely to result in a bad first impression: I will start to hate you for having unintentionally made my life harder. Honestly it takes you no more time to simply type out your reference the old-fashioned way. Write your references as you go along. In a separate document, whenever you refer to a person’s work, just write a reference. You can also use the ‘find’ tool to check you haven’t already written a reference for that person and that particular work. If you do this first time through this will eliminate the ‘reference missing; please provide’ queries that will otherwise litter your book. I did this when I was doing all my writing as a student; I’m sure writing a book is a bit different, but I’m not that organised and I still managed to do it. Please. Check spellings! I’m sorry, it takes me much less time to write a query to ask if you mean ‘Thomson’ or ‘Thompson’ as you’ve used both than it does for me to Google the work in question (and looking it up isn’t really my job). And I will write that query (or copy-paste it) wherever it occurs, and you will start to hate me for it. If it’s a name you struggle to spell, put it on a literal post-it on the edge of your monitor so you get it right every time. Giving me the web address doesn’t absolve you of the responsibility for providing other details. Please give the author, where possible, as well as organisation/publisher, date, and location. Please also provide the date when you last checked this link – I may not need it but some style guides ask for it. Be systematic. If you always reference your works in the same way, this helps in a number of ways. Firstly, it helps you make sure you’ve given me all the information I need, because sticking to a pattern helps you spot when you’re missing a detail. Secondly, I have a style to stick to, and if all your reference differ from that style in the same ways, I can often do a ‘global’ change where I change one particular feature of all your references in one fell swoop (this isn’t fancy, I use the Find and Replace feature in Word which can be found by hitting Ctrl+F if you’re using Windows). I will always have to change your references from ‘your’ style to ‘my’ style in some way, and that’s not a problem. It’s not rocket science. Yes, different types of references are referenced in different ways, and while you should be A-OK on journals and books, Green Papers, White Papers and what on earth is this brilliantly useful but completely obscure PDF I picked up might not be so easy. But essentially I need the same information for any kind of publication, so here is how to think about referencing obscure and complicated things. 1) Who wrote it – a name or list of names is great if they exist (do some sleuthing) but the organisation it was written on behalf of will do. 2) A date. Again, you may need to sleuth. 3) A title. This should be the most obvious thing to find. 4) if the reference is a report or paper of some kind, or maybe even a speech, then the title in (3) is the equivalent of a journal title, so you still need an overarching title, such as what series of reports it is from. If (3) is just straight-up the title of this thing, then you don’t need this bit. 5)Publication details – preferably a geographical location, followed by a publisher (except for journals, or reports in a series, where I need volume/issue numbers/serial numbers/any other identifier of that nature). If there isn’t a publisher, then it’s probably published by the organisation that also ostensibly authored it. Never mind, give me that information again anyway. As for place, if you don’t know, just google whatever you’ve identified as the publisher. That should provide your answer. 6) If: you think it’s useful/you’re still not sure you’ve given enough information/whatever, give me the web address and when you accessed it (if you accessed it online). If nothing else, that will help me if I can’t figure out what your reference is meant to mean, and it will obviously help your reader. Job done. Re: rocket science. The above point is not a definitive guide to referencing anything. But it should give me all the information I need to construct a reference properly from whatever deluge of information you’ve provided. At the end of the day I’d much rather a deluge of information which gives me the tools I need, than ‘HMRC, (2012) Some Random Report, But Whatever‘ which leaves me stranded. In the fullness of time I might make a flow chart, which I’m sure will be incredibly helpful to the three people that read this blog. That’s more or less it. I should probably go back to checking the references of the book I’m currently working on. *If this all looks like too much hard work/you feel tired thinking about just reading my thoughts on references, try and mess up your references so much that I have to charge extra hours to fix it, but bear in mind that this method will also create a lot more work for you to sort out afterwards, and to be honest, I would rather have an hour’s less money and easier references to deal with even if that means I’m eating exclusively from the Clearance shelf at Nisa for a month. **I’m reasonably certain no-one condones the dyeing of cats, and I made up the Veterinary Convention, so if such a thing exists, I’m sorry for the resemblance, and I’m sure none of its members are supervillains. Sorry. And please don’t dye your cat. This weekend just gone, S and I had an adventure which I’ve been thinking about since S first moved here. The Cleveland Way, one of the many long-distance paths one can do around the British Isles, passes right by our door here. It runs down a good chunk of the North East coast but I wanted to do the stretch from Whitby back to our door. So finally, with a long weekend coming up for this weekend, I got the map out, measured the distances involved, spotted a good midpoint overnight stop off in the form of the Boggle Hole youth hostel, booked it up, and looked out the local bus timetable. And, first thing on Saturday morning, we got to our local supermarket as it opened, filled the tops of our rucksacks with all kinds of bits and pieces from the deli counter (well, it *was* our holiday! ), and then got on the bus to Whitby. We had a lovely weekend which I’ve partially documented on Instagram (@jennydegenhardt, feel free to put in a follow request). The coastal path was beautiful, not highly varied as a lot of the land by the coast is mainly farmland but there were some lovely coastal landscapes/seascapes, beautiful little wooded dells, fantastic bays – and it was wonderful to get out and do some real walking for the first time in a while. The walk from Whitby to the hostel was only about seven miles, so after lunch and having checked in we did another seven miles poking around the local countryside and found our way onto the North York Moors very briefly before heading back to the hostel. Then we had an idyllic evening sitting outside with wine and our books, a hearty catered dinner (we had brought stuff to cook but we felt like treating ourselves! ), before a walk along the beach and an incredibly restful night’s sleep. Incidentally if you’re planning a UK holiday at any point, you could do much worse than the Boggle Hole YHA. It feels like a real escape as it’s tucked into a tiny inlet about a mile down the beach from Robin Hood’s Bay, a beautiful little fishing village. the hostel is right on the beach where a small stream runs into the sea, and it’s tucked into some lovely woodland (which is great for children to explore as well, as it features a ‘storytelling circle’ with a throne and benches surrounded by a wicker fence, various other little ‘scenes’, and a cottage where the Wolf from Red Riding Hood sleeps ominously…). We were offered a private room as the place was otherwise fully booked, and our room was twice the price of sleeping in dorms, but was no different except that there was only one set of bunks in our room, so I would argue it wasn’t worth the £60 we paid, but nonetheless we had a lovely time. Note that if you don’t take a private room, a bed for the night is only £13, which is very good value for the stay we had, and the staff were all lovely – so with that one reservation, I would strongly recommend it! Our next day then was a long one – about fifteen miles – which was a bit much for S’s not-fully-broken-in boots and my general unfitness! We made it home though, and had a great weekend. A hundred yards from home, S said to me, through a fixed grimace, ‘next time you suggest something like this, I’ll punch you in the face. I’ll still say yes, but I’ll hit you first’. I’m pretty sure we both had fun. So much for weekly updates! To be honest, not too much has happened. I made another skirt – this one was self-drafted! – of which photos are on my phone so will probably never make it here because I’m a lazy technophobe. I am also making a long-sleeved jersey top using the Renfrew pattern from Sewaholic, from a lovely cream and grey striped jersey which I bought from Guthrie and Ghani on a whirlwind visit to family. My dad meanwhile has started a blog about his work in social policy and the third sector. I won’t link here, but email me if you’re interested and I will pass on the link. And I do mean email, because then I know that I know you! S’s birthday was recently and we had a lovely meal out, a good night in the pub with friends and an unexpected pub quiz, and I made a cake (a rare feat chez OTB!). We have also found a beautiful flat in Old Cathedral City, sharing with our friend M, which is in the very centre of the city surrounded by twisty little streets, amazing pubs and bars, intriguing little shops and plenty of yarn/fabric shops as well! The flat itself is gorgeous with big windows, a huge central room, a balcony in our bedroom and a bedroom that literally looks like it came from a hotel. There is also a quirky little platform in one corner of the lounge which M and S are planning on turning into their ‘man cave’, filling it with cushions and beanbags and then all the screens and games consoles you could wish for. It’s OK, I will be allowed in – S recently got a PS3 so we’ve been playing some awesome karting games and platformers. I’ve tried some shooters but I really can’t get my head around walking with one stick, looking around with the other stick, and also attempting to jump/duck/crawl/peer/sprint AND potentially shoot/change weapons/aim… I do try but I lose patience very rapidly. We are also going to be getting a car at the end of this month! We’re both having refresher lessons because it’s been a long time. That really is about it. 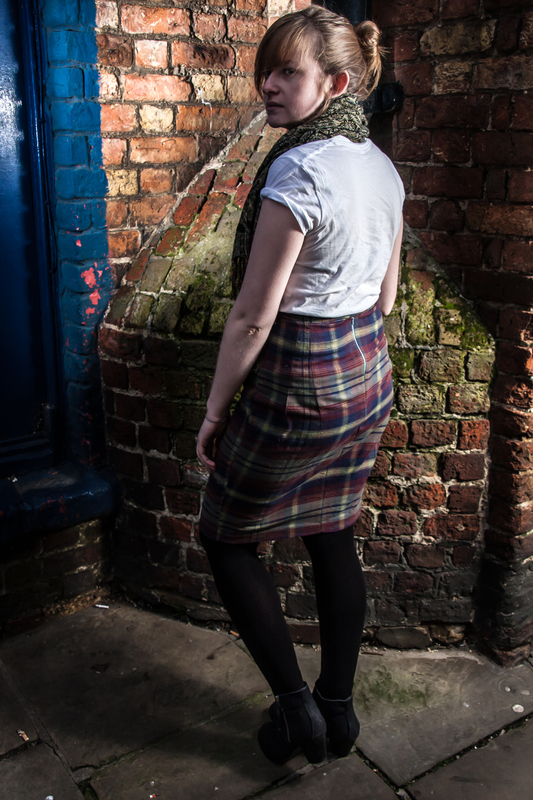 My Charlotte skirt post has now been updated with photos. Although the originals were taken on S’s DSLR, and the edited JPEGs are juicily large, for some reason WP doesn’t like them and so they are pixelly if I put them any larger than this. Even though (promise) you can blow them up to ridiculous proportions on my screen. Look out for future crafting posts though, because they are surprisingly close to fruition! This is one of those posts where I’m trying to convey a sense of my life while obfuscating details and disguising emotions. My chosen method for obfuscation, disguise and display today is a list. Blogging is a strange thing. I have now made two skirts. I have another project on the go, something lined up for tomorrow, and a head full of future ideas. I have got really stuck in to a knitting project which was promised for last Christmas and may take the rest of my life, but I’m really enjoying it, and I hope it’s loved when it finally reaches the intended recipient. Jokes aside this should be before said recipient’s birthday. I am very excited about some future possibilities based around where we are moving to next, and the possibilities this opens up. I am considering carefully my future options, but at some point in my life it’s possible that I won’t be working from home and playing ‘house’! This is a career dream and I am a) so concerned about internet security that I am convinced there are spies everywhere who will find this blog and think I’m not someone they want and b) convinced I will jinx myself by revealing any more. I am playing in a fantastic orchestra. We’re doing some amazing repertoire and I love having my cello out again. The scenery around here is fantastic and now S’s walk home takes him past the seaside I have taken to meeting him to walk or run home. We will be moving in the summer to a bigger city. While I love our seaside home, I am looking forward to all the extra fun things this will involve, like climbing, a new choir, more board games and a sense that more is going on. I seriously considered joining the WI a few weeks ago. We have been playing a lot of board games. I am really enjoying them, and starting to get semi competent at them, which is great. I want to make ALL THE CLOTHES EVER. That’s approximately it from here. There is more, but it’s pretty similar to what’s there. I did have a job in sales. I wasn’t very good at it. I left before I was asked to leave, and while I am now working hard to feel busy, and I’m sad I never started to turn friendly acquaintances from work into genuine friends, I’m glad I left. Blog-wise, S has started a new blog about the things he enjoys doing. I think I might do similar – attempt to write once a week about the things I have done that have been fun. It might encourage me to finish more of the things I start and make more time for the things I enjoy, rather than just crashing out in front of the telly of an evening. *At some point in the less-employed parts of the last few months, I (years after everyone else) actually watched Gavin & Stacey. I loved it. 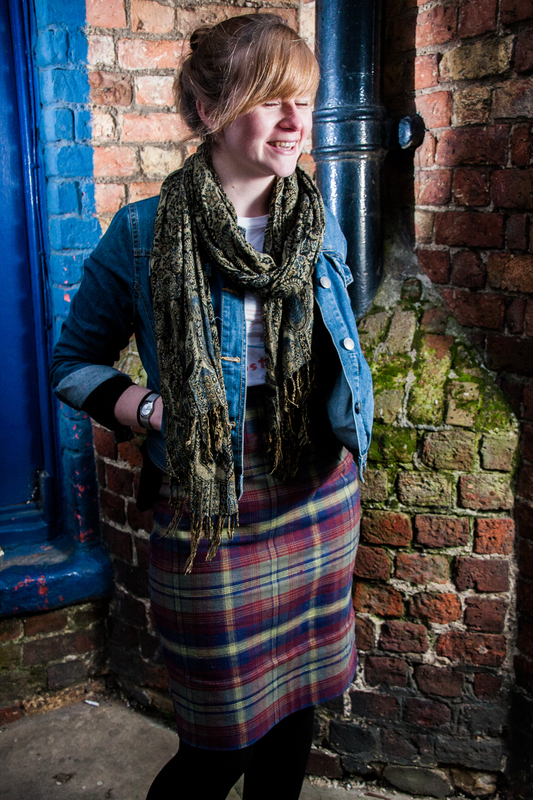 I’ve finally got photos taken of my wonderful Charlotte Skirt! I bought the Skirt Kit while I was teaching because I didn’t have a lot of time and I really wanted to get started on a project. Then it turned out that I actually had no time, because teaching is a thing to do if you suddenly think you never want to do any of your hobbies, sleep a whole night, or see any of your friends and family ever again. (I’m joking, and I mean no disrespect to the teaching profession, but seriously: No. Time). Anyway, bought the kit. Stared at it longingly for months. Finally, made it. I’m really happy with it, actually. It was easy to sew, and the instructions were really clear. I didn’t alter the pattern at all because I wouldn’t know where to start, but I think it works well on me as-is. It’s not very neat on the insides (at least around the zip, and I did something of a hack job on the hem) but all seams bar centre back are Frenched (I don’t have an overlocker but I like doing French seams even if they are time-consuming!). I had some trouble with the invisible zip – it’s a bit hard to visualise and I had to unpick and restart twice – but the instructions again were pretty clear, I’m just a beginner sewist who can’t tell her lefts and rights! I also googled some tutorials for it (I’m sorry, I didn’t save links). The one thing I did learn is that while the instructions tell you to use the invisible zipper foot while doing them, if you don’t have an invisible zipper foot, a normal zipper foot will also work. It’s harder to get the zip truly invisible though. Some fantastic people can do it, and as for me, well, it’s not invisible, but I can live with and work on that! I was proud of my hemming which I did by hand, it’s very nearly invisible from the outside. The waistband though I really didn’t do a good job of! Some lessons very definitely learned about how to attach a waistband, and subsequent hook and eye placement! Overall though I’m very happy with my skirt. I love it styled like this for every day (though I would love to pair it with a leather jacket, which in my case I have not got) but I also have worn it to work and it goes with a variety of blouses, and with the right shoes and top would make a good going out/pub outfit as well (if I was the type to go to the pub ‘dressed up’, or if indeed there was anywhere even half-worth going to in Seaside Town other than pubs). It’s close-fitting, and very pegged (i.e. it tapers in a lot to the knees, so not much range of movement), so if I were to make a longer version it would have to have a split or a kick pleat in the back because I take such big steps and I walk a lot. I’m not really impractical enough for fashion! 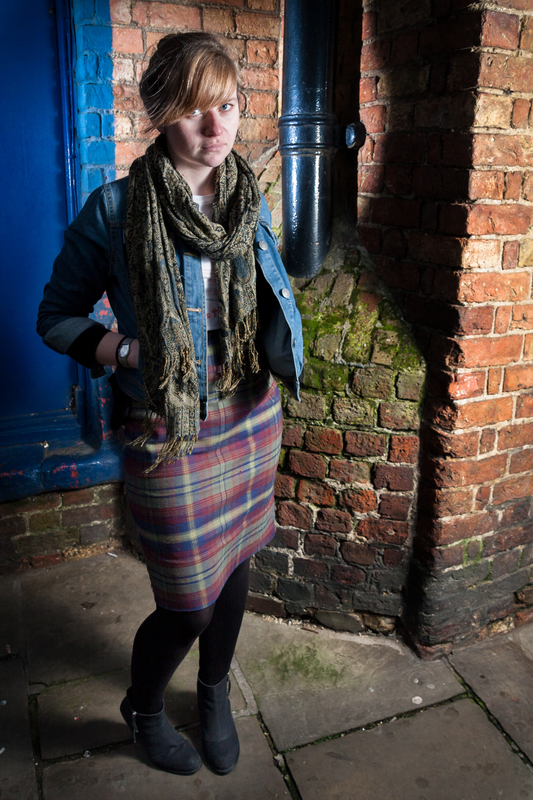 Anyway, there you have it – one Charlotte Skirt! Already planning a few more, but I’ve got other projects I want to make first…!